So far, they have laid two batches, one on 6 April 2004 and another on 29 July 2004. These photos are for my own records, but there is a very good guide at Caudata.org. The first batch were photographed every day or two with a simple point and click digicam, the second batch with a much better camera (which is why I have recorded the sequence again). 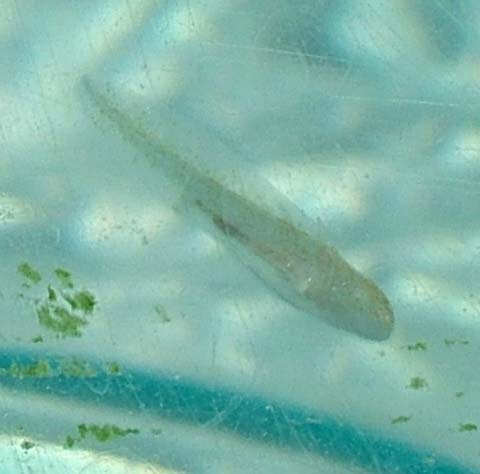 In both cases the eggs were from a female albino, however the male was wildtype so I expected the axolotls eventually to take on a wildtype colouration. 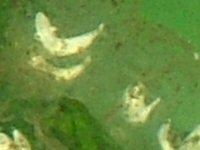 In the first batch one juvenile remained white, the others did become mottled. However in the second batch, the only survivors were the three albinos - all wildtypes died within a few days. At the start of October 2004 a fourth batch was laid, but this time the mother was the wildtype rather than the albino (paired with my one, wildtype, father). 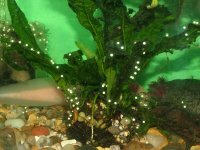 I rescued 5 of the eggs after the others hatched while I was out, and transferred them to a separate tank. One hatched, the other four did not, so a couple of days later I broke the eggs open with small scissors. The next day all five babies are doing well. They are being fed baby brine shrimp. Photos and progress reports when possible. A surprise from my 'lotls - eggs! The eggs look mainly the same, but have a little dirt around the jelly now. The most rapidly developing embryos look like white beans. 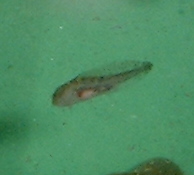 Now some look more like tadpoles, with little buds for gills. 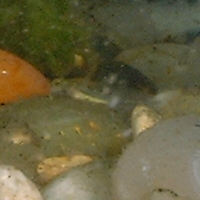 On day 8 I realised at least some are likely to hatch and got a tank divider. 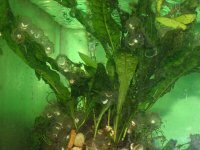 This is how the tank looks at present; adults, shelter and food on the right, filter and eggs on the left, with a water-permeable plastic divider between them. 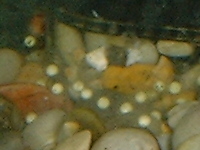 It is noticable that some eggs from the other end of the tank are only just turning bean-shaped. I am concerned I may have been a little rough when moving them into the "hatchery" end. I have also dropped a little Liquifry No. 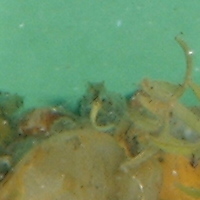 1 over the eggs, to stimulate the development of infusoria. 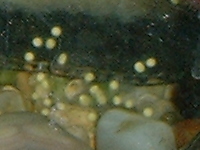 The jelly around the eggs is attracting dirt, which makes it harder to see. They are now a little longer and thinner, but the same shape. 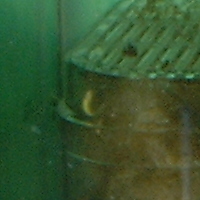 At the back, one of the earliest eggs stuck to the filter. 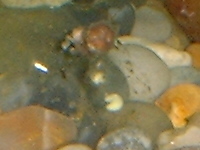 Notice how this one has changed position in the egg from the previous day. 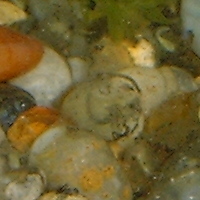 The most advanced embryo, seen in the centre, is now taking on wildtype colouration. The one in the top right is still white. At last I have a hatchling! 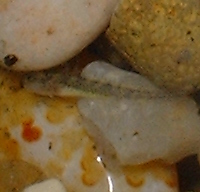 Hard to make out because he is so camouflaged, but the light coloured line sitting on the grey stone is the baby's body, his head is in front of the edge of the orange stone. The empty egg lies slightly deflated, just out of shot. At last I am a proud mum! 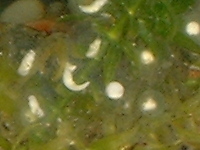 I removed many more eggs which were not developing and were still white, leaving two or three more which may hatch. A day later and there were at least five babies, most of which appeared overnight, and one of which remained albino despite mixed parentage. Albino on the left (in darkness I'm afraid), wildtype on the right (1 day old!) 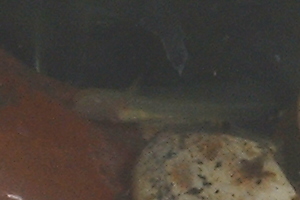 You can just make out the gills, but no leg buds yet. I'm feeding Liquifry No 1 and hoping they all survive. I finally managed to get one to stay still long enough for a photo. Until a few days ago, several could be seen now and again including an albino. This morning I can only spot this one, a little larger than the others, with back legs already. Unfortunately this was the best photo I could get. Another week or two later, and having had no sightings for a few days, I conceded that all the hatchlings were gone, and removed the tank divider. The eggs were laid in the evening. The weather is warmer than last time (30C) and they are developing fast. Last night the eggs looked ready to hatch, and this morning about half are out. Click on these two images to view fullsize. 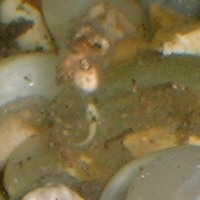 You can see the gills - but the baby is transparent and looks like a ghost. Today was crisis time. I noticed that there was a lot of crud forming on the gravel - then I noticed that what yesterday were baby axolotls today were just lines which dessicated as the water moved around them, adding to the crud. I cleaned up what I could, then fed so that any still alive would hopefully move about. I rescued one baby this way and a little later found a second - both albino. I moved them to a clean bare tank which I had just set up for daphnia (and had a few daphnia in it, hopefully there will be juvenile daphnia which will create food for the axolotl babies) as there was nowhere else for them. 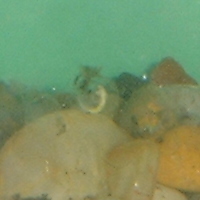 The photo is of the one of them in the new bare tank. I am crossing my fingers that this was a good move. 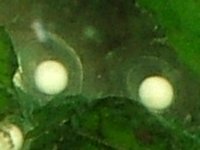 Next time I will move the eggs just before they hatch rather than raise the babies in a partitioned section of the main tank. Last night I rescued a third and final baby - again albino. All others are dead. They all survived in the new tank overnight, and have some daphnia in there with them as well as being fed liquifry twice a day. The photo show this third one, a little more developed - you can see the heart and the waste in its back passage. Again you can click on the images to see them full size. The oldest lived for two months before mysteriously dying.